1. Melt half of the coconut oil in a medium non-stick ovenproof frying pan. Slide in the chicken pieces and stir-fry gently for 7 minutes until the chicken is cooked. Check by slicing into it to make sure the meat is white all the way through, with no raw pink bits left. Leave to one side. 2. Melt the remaining oil in the pan over a medium to high heat. Add the sliced onions and cook for 10 minutes, stirring every now and again until the onions are soft and lightly browned. 3. Turn on your grill to maximum. 4. Crack the eggs into a bowl and beat together with a small pinch of salt and pepper. Crank up the heat under the onions to maximum and add the spinach, turning it regularly until wilted. 5. Pour the beaten eggs into the pan, and as the tortilla sets round the edges, draw the cooked egg into the middle, allowing the centre to be filled with raw egg. Continue to cook your eggs like this until the mix is three-quarters cooked through. Turn the heat off under the pan and crumble the feta evenly over the surface of the egg. 6. Slide the frying pan under the hot grill. Let the tortilla grill for 2–3 minutes, or until the feta is just starting to brown and there is no raw egg visible on the surface of the tortilla. 7. 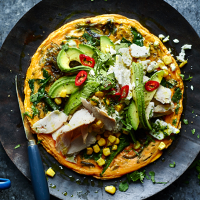 Remove the pan from the grill, carefully slide the tortilla onto a chopping board and scatter with the sweetcorn, cooked chicken, avocado, coriander and red chilli. Wedge it up and serve.